Check out our site, enjoy, and learn. At Diving Cairns we are passionate and professional divers knowledgeable on the sport of scuba diving. Working on the Great Barrier Reef over many decades, we've got a wealth of information that we're only too happy to share with anyone who has an interest in the Great Barrier Reef, immersing you in the beauty and richness this World Heritage icon is renowned for. Our local knowledge also encompasses the Far Northern Reefs and The Coral Sea as well as the beautiful wet tropics, the tablelands and outback. We strive to offer the most comprehensive information covering all aspects of scuba diving, skin diving and snorkelling the waters of Tropical North Queensland. From beginners and novices to the hard-core diver, whether you are on a mission to dive and only dive whilst in Queensland, or whether you want to combine your holiday with the multitude of enticing attractions in this region, Diving Cairns is your ultimate guide. If you can't find the information you need, contact us and we'd be only too happy to help. We aim to give you all the necessary information to make confident choices about your Great Barrier Reef diving experiences. We are divers, and we know exactly what your options are by staying in constant contact with the companies that offer them. With our extensive local knowledge and support from our travel industry, Diving Cairns can satisfy all of your local touring, diving and accommodation requirements with the minimum of fuss. Ensure your holiday plans are in good hands. When arranging your diving holiday ensure that you are dealing with a reputable website. 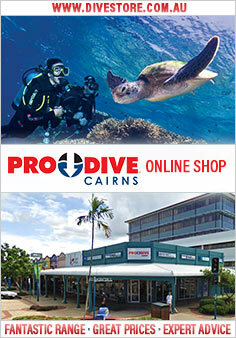 Diving Cairns is a licensed travel agent and a member of the Travel Compensation Fund. Our license TAG number is TAG 1837 - so you know you can trust your diving adventure with us! Check out our site, enjoy, and learn. Happy Diving!